After taking a one year break from issuing Dodger cards in their potato chips, Bell Brand returns with a more traditional set. 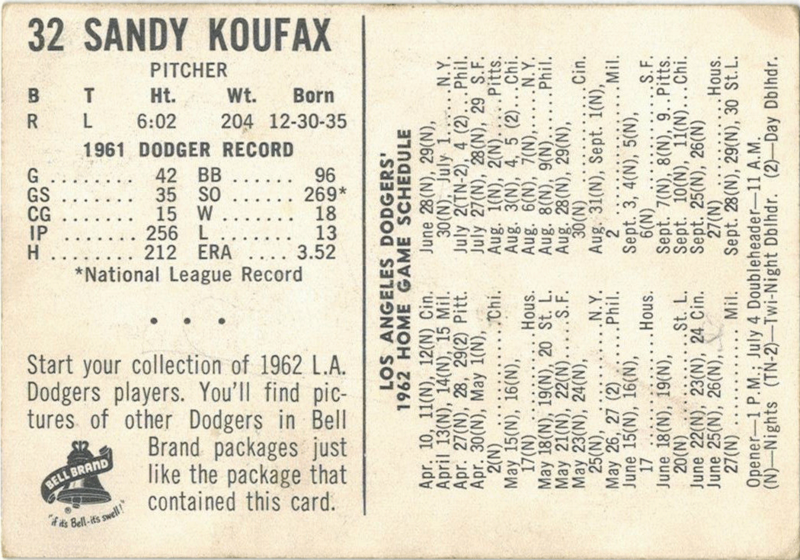 They are the same size as your typical Baseball card and feature a short biography and game schedule on the reverse. 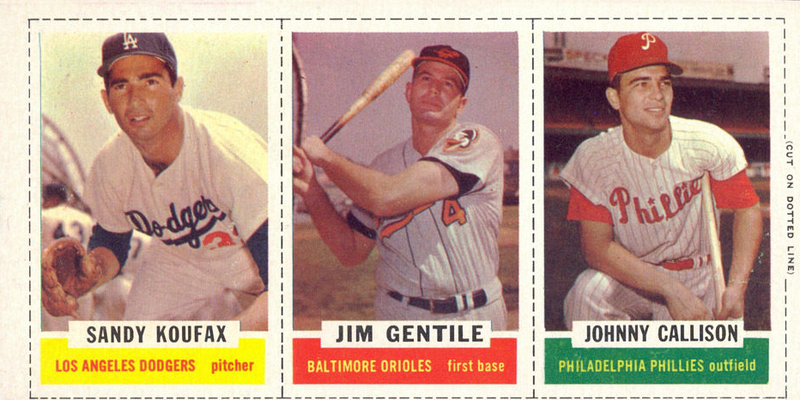 You can sometimes find a card still wrapped in the original cellophane to protect them from getting potato chip oil on them. I would be surprised to see one of these ever again. 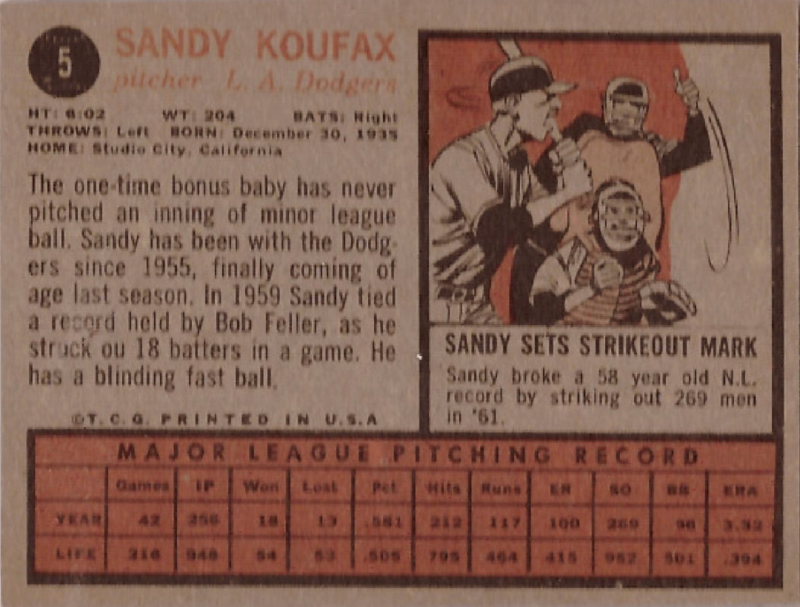 Back in 2009 I was cruising through eBay and came across an unusual 27 piece set of cutouts that were printed in the sports section of the Herald Examiner in 1960. 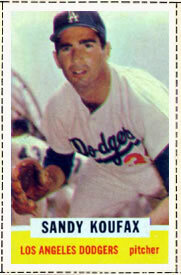 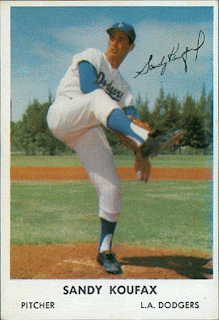 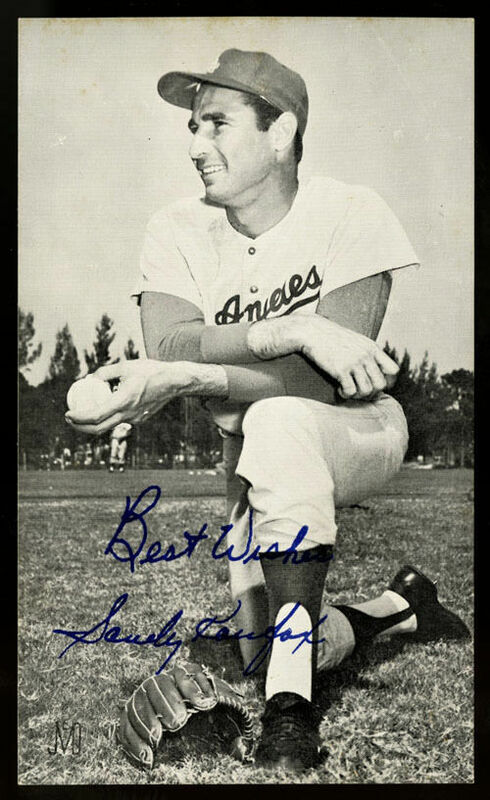 Below is the Sandy Koufax cutout from that set. 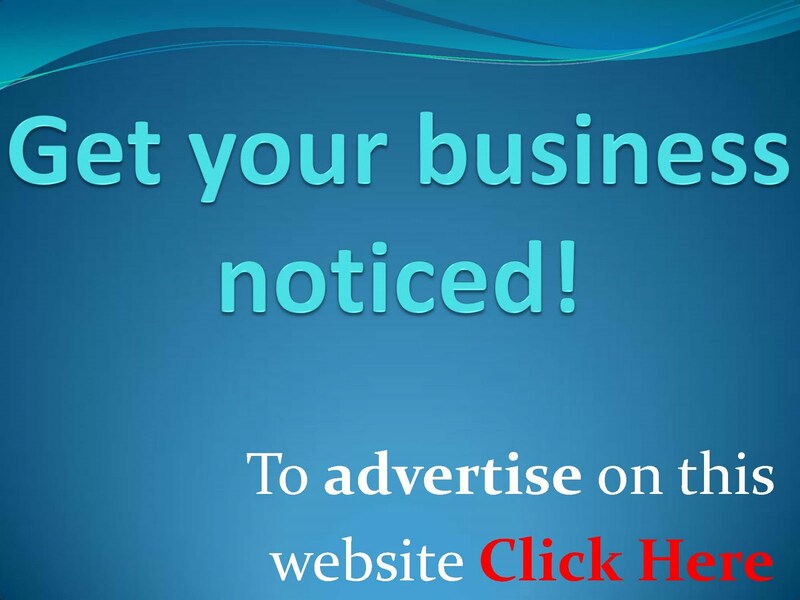 Go here to check out my original post on them. 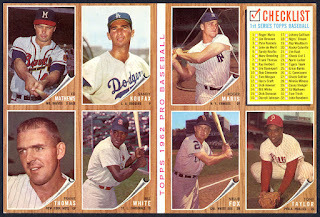 At the time, the complete 27 cutout set sold for an amazing $155.00. 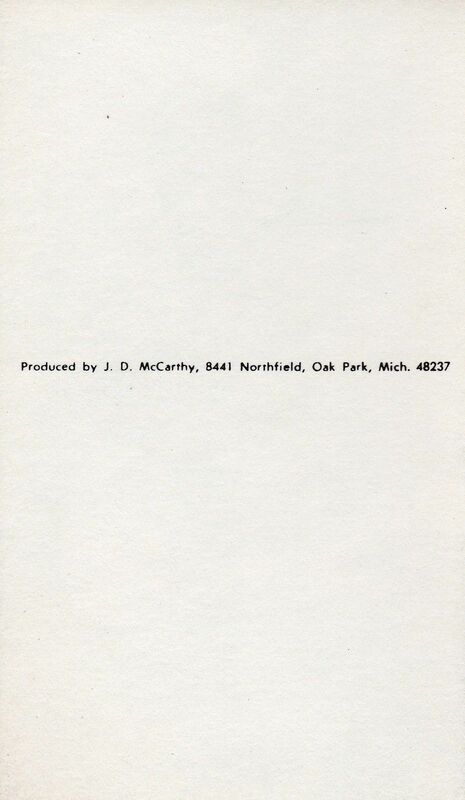 Morrell Meats returns for a second season. 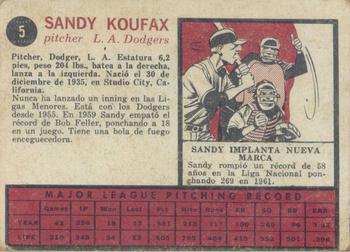 These cards are notable for having the LA Coliseum in the background. 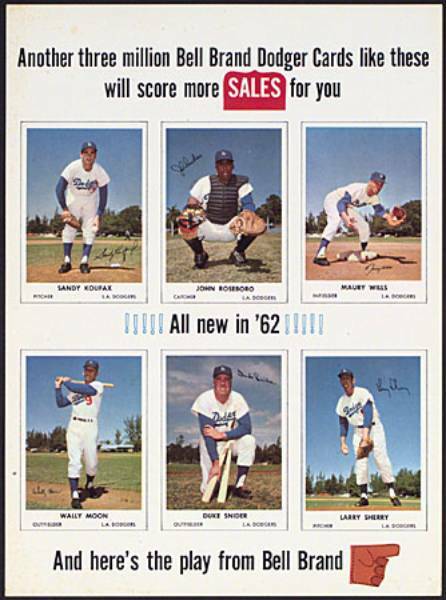 Postcards sold at the stadium feature the exact same image used for the above Morrell Meats card set. 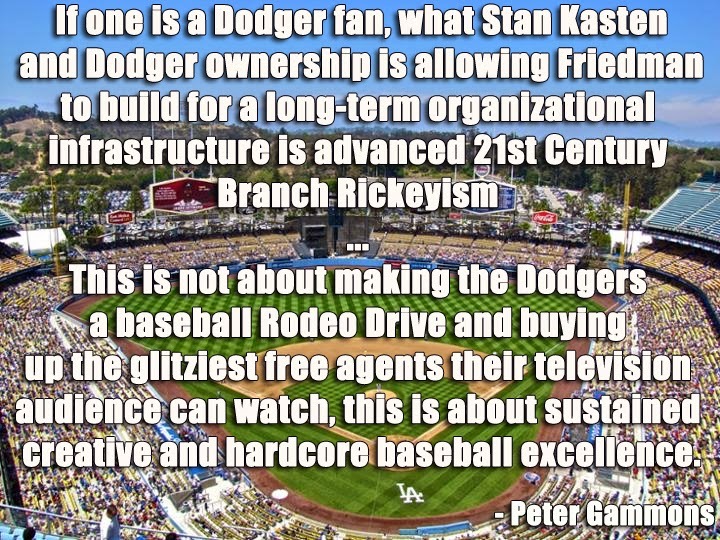 Union Oil/Union 76 begins their longtime affiliation with the Dodgers with the below booklet that were handed out at local gas stations. 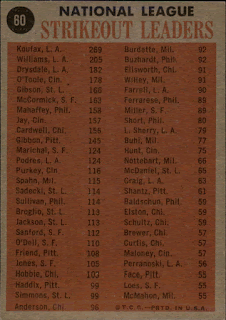 Unfortunately, I do not have scans of the inner pages. 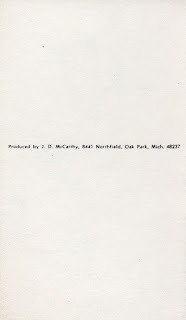 Since I have a general lack of clarity on the exact issue date for JD McCarthy postcards I figured I would just list them here. 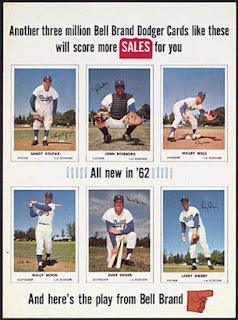 From what I understand, these postcards were printed over a period of decades, and are quite plentiful. 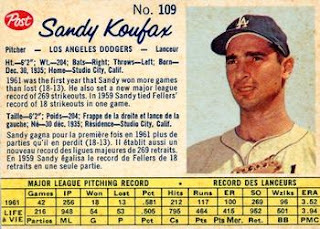 There are at least three different Koufax version available (including one with a facsimile autograph), but many more may be out there. 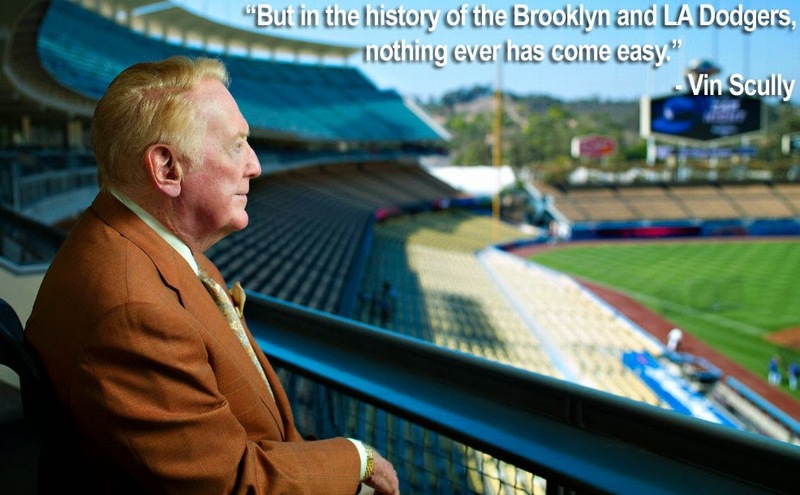 Most west-coaster have no idea what Manny's Baseball Land was, but to many fans from the New York area they were the place to go for your memorabilia needs. 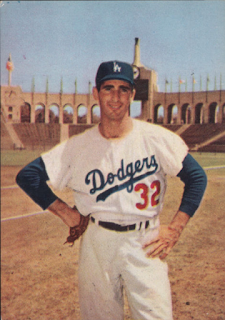 They sold pennants, pins and t-shirts, and even created their own team photo sets featuring many of the more popular clubs in the game. 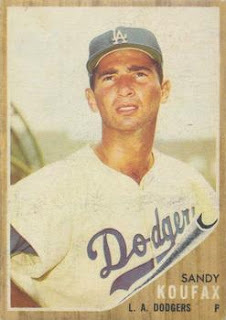 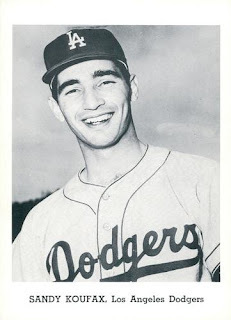 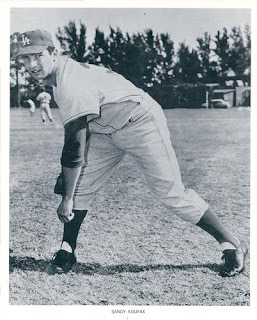 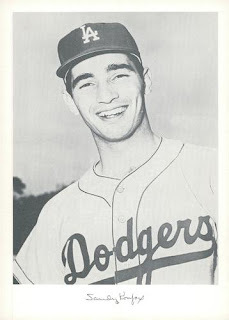 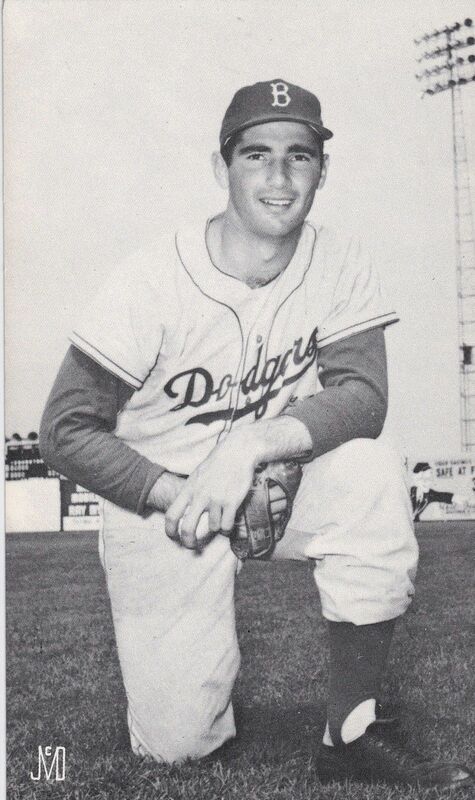 The below Koufax photo is from a 10 player Dodger set created in 1960. 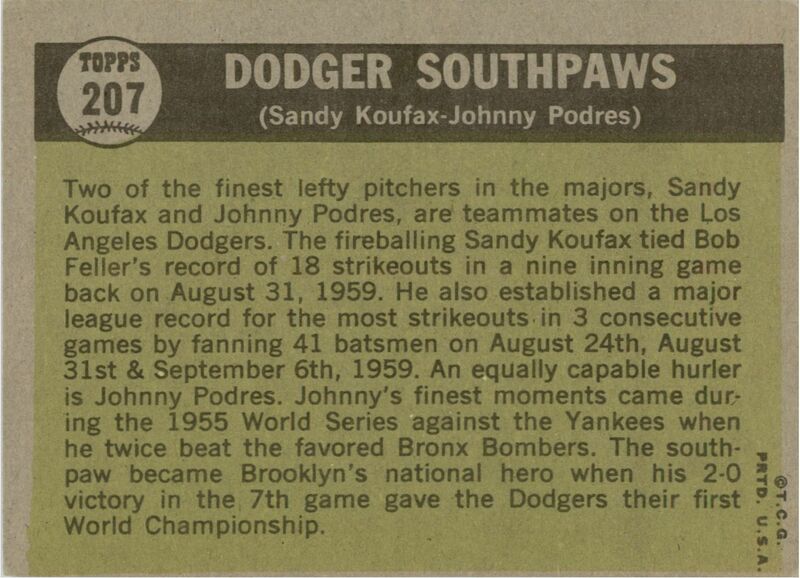 BTW, the store was located across the street from the Yankee Stadium bleachers on River Avenue in the Bronx and lasted from the 1940's to 1978. Then it moved to New Jersey, first to Cliffside Park, then Hackensack. 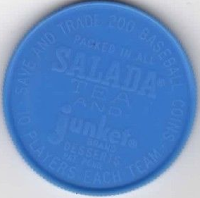 From my understanding, they closed their doors about 7 or 8 years ago (either that or they sell strictly online under a different name?). 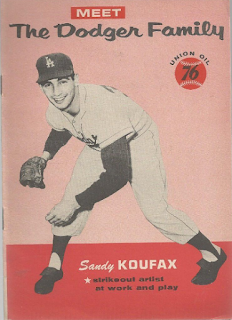 In 1961 Union Oil/Union 76 returned with their second edition of Dodger Family booklets. 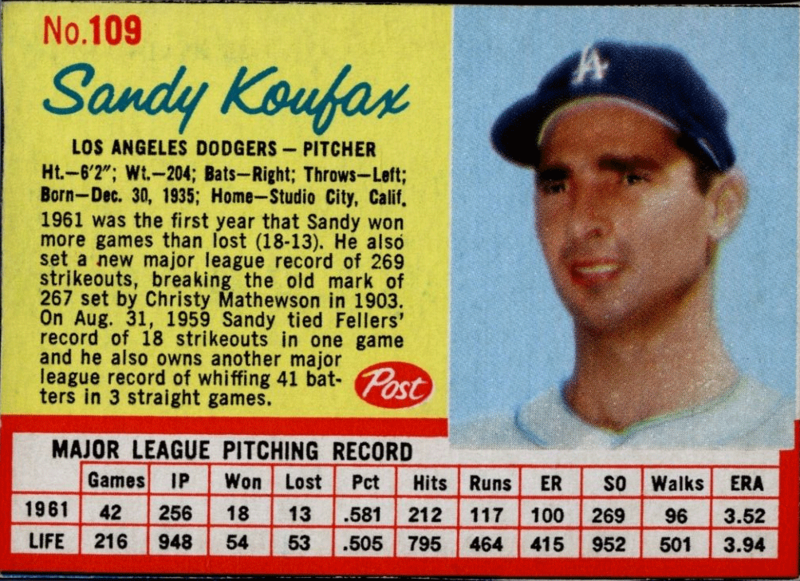 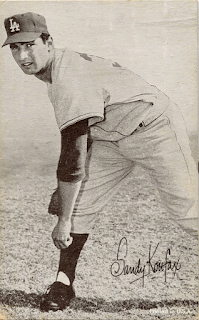 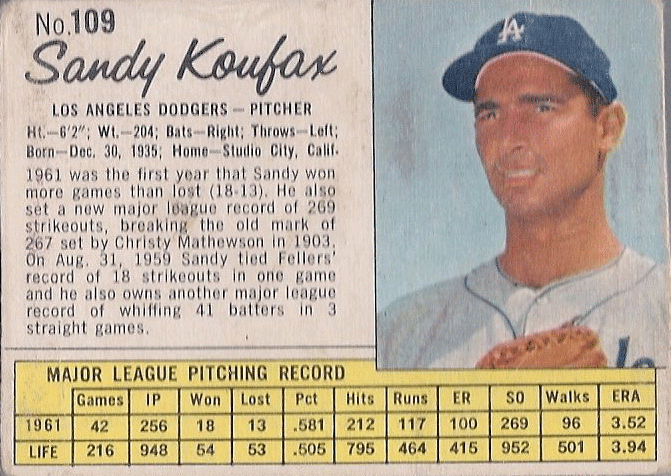 You can check out complete scans of the Koufax booklet here. 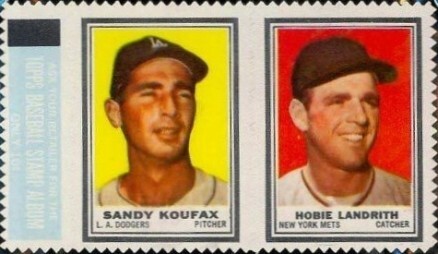 These stamps were inserted into packs of the 1962 Topps Baseball packs as a panel of two attached stamps. 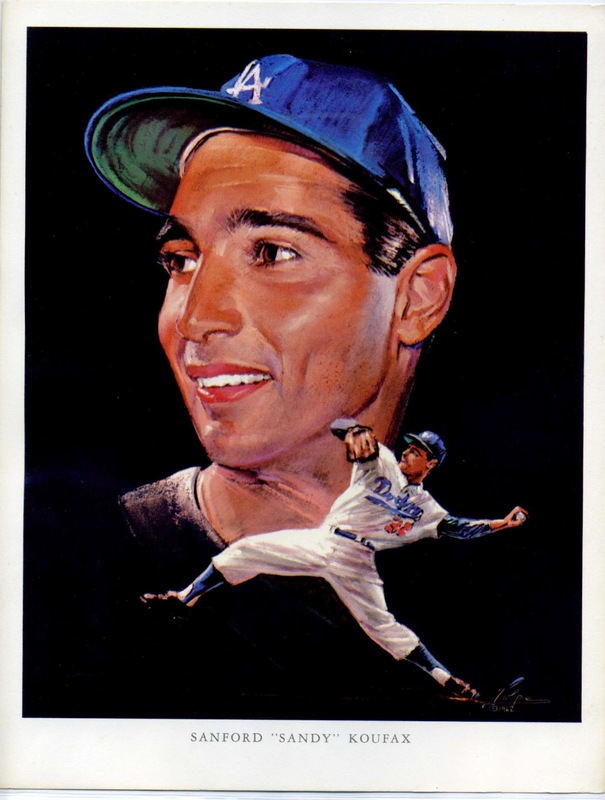 Below is the Koufax stamp on its own. 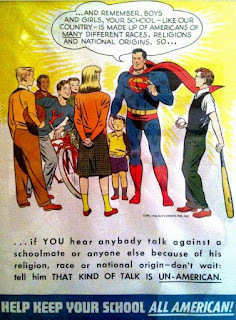 I also show the various panels that exist. 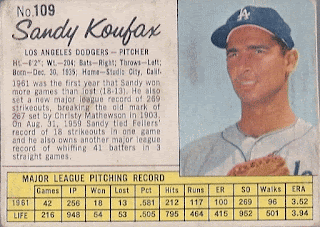 From my understanding, Koufax was paired with three different players: Hobie Landrith, Bob Shaw and Joe Adcock. 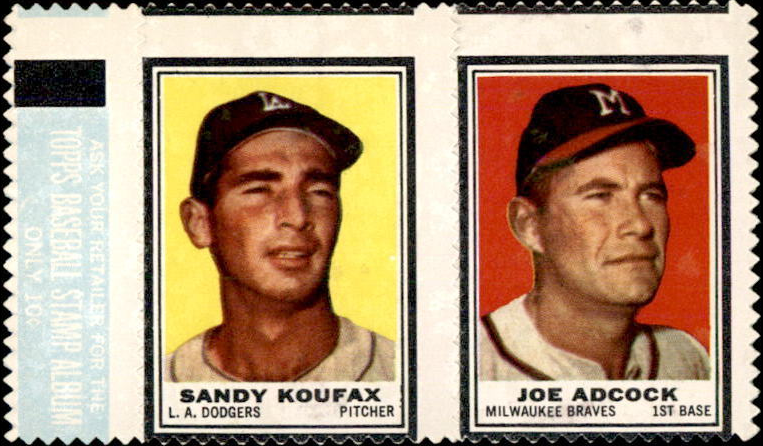 These are cutout cards found on the back side of a box of Bazooka gum. 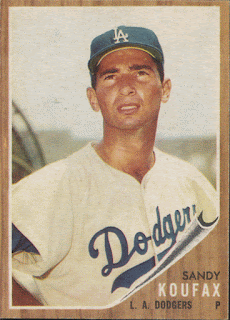 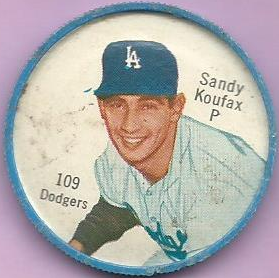 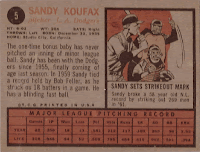 Below is a photo of a complete uncut box featuring the Sandy Koufax panel. 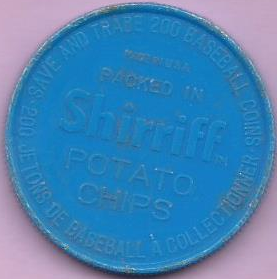 As the name of the below sheet suggest, this item was provided to retailers as an example of the cards that would be promoted with packages of Bell Brand potato chips. These are very scarce. 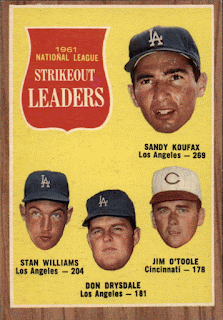 Of note, the cards pictured in the ad sheet feature the 1961 Bell Brand cards. Exhibit cards were sold through coin operated machines, are about the size of a postcard and printed on thick cardboard stock. 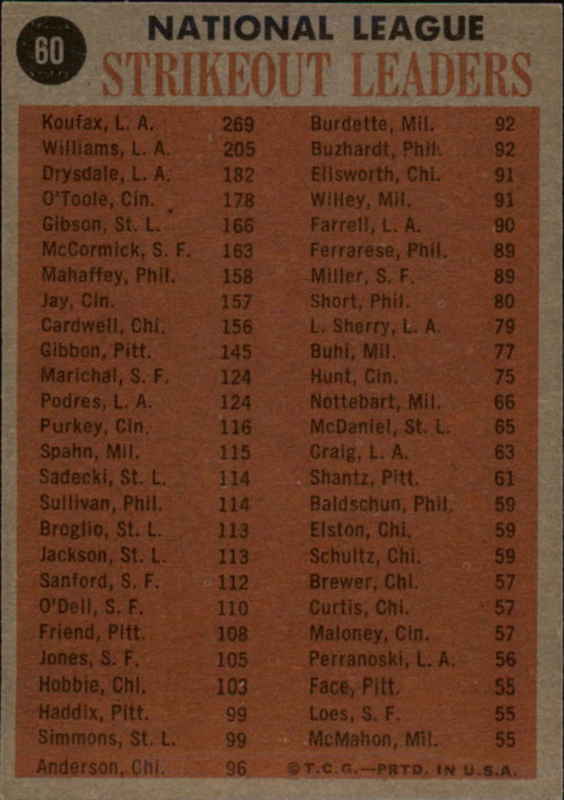 BTW, a blank back version exist and an exact date of that issue is not known. 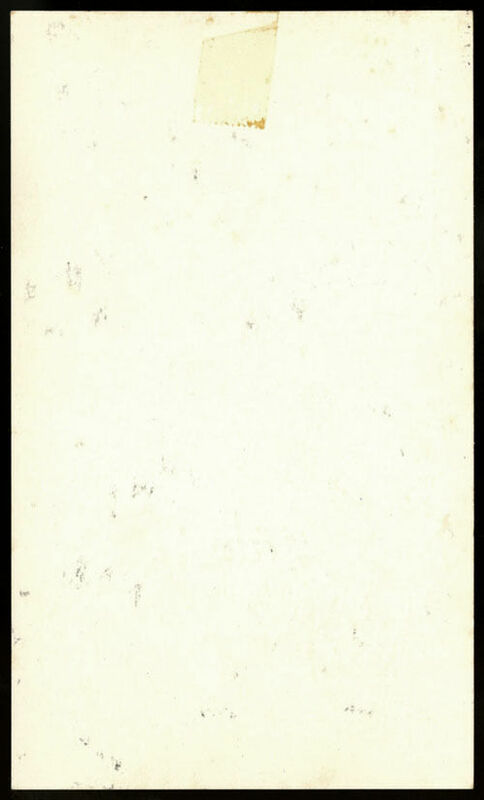 Generally, blank back Exhibit cards are given the manufacture date from 1947 to 1966. 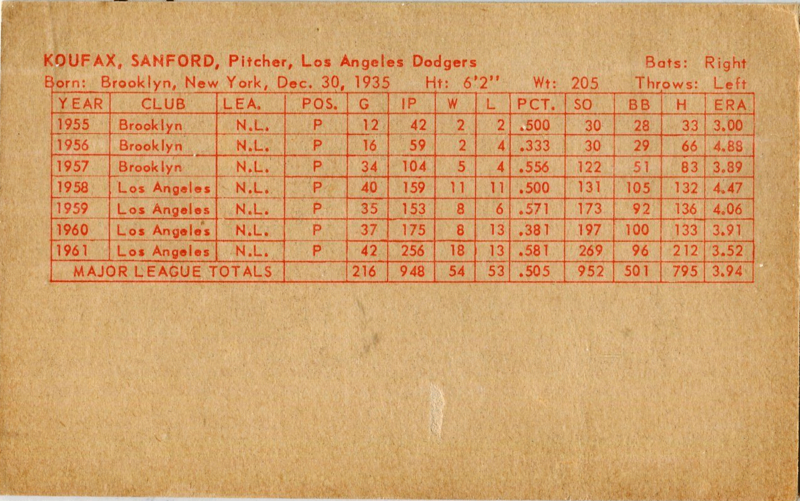 Since the statistic card shown below provides a specific date of issue it is regarded as being from 1962. In 1962 Jay Publishing issued several team photo packs; including the Los Angeles Dodgers. There are 12 players in the set and measure 4.25" x 6.25". The next four Koufax issues are all cardboard box cutouts, and as you can see are all striking similar. 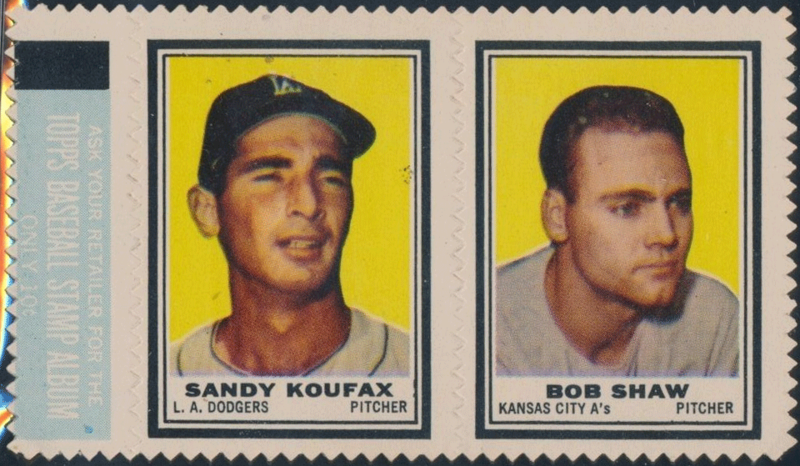 Small variations exist depending on who was the issuer. As speculated in an older Standard Catalog of Baseball cards, this pin is thought to be from 1962 and is assumed to have been sold at Dodger Stadium concessions. It measures 3 1/2" in diameter. Various versions are known to exist. 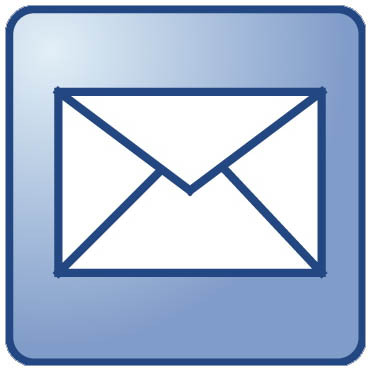 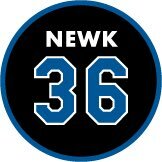 Below is the white background pin. 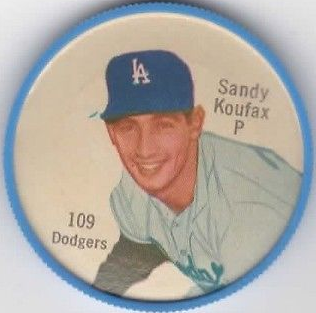 There is also a blue background pin, as well. 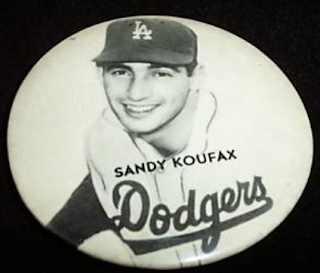 There are also two styles of name presentations known - those with the name in a white strip at the bottom of the pin and those with the name overprinted on the photo. 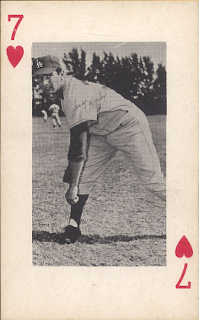 1962 Pittsburgh Exhibits 7 of Hearts. 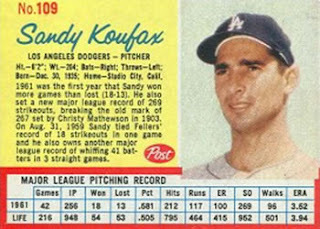 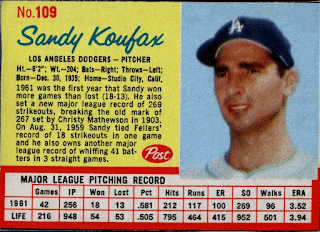 Margolis adds that Koufax's 1962 Pittsburgh Exhibits card is also elusive. Little is known about this issue, but the set's emphasis on Pirates players suggests it was released in the Pittsburgh area in 1962 (though there's no copyright information on the cards). 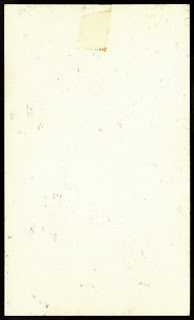 Showcasing a playing card design, the cards were reportedly distributed in penny arcade machines at various locations, including Kennywood Amusement Park near Pittsburgh. 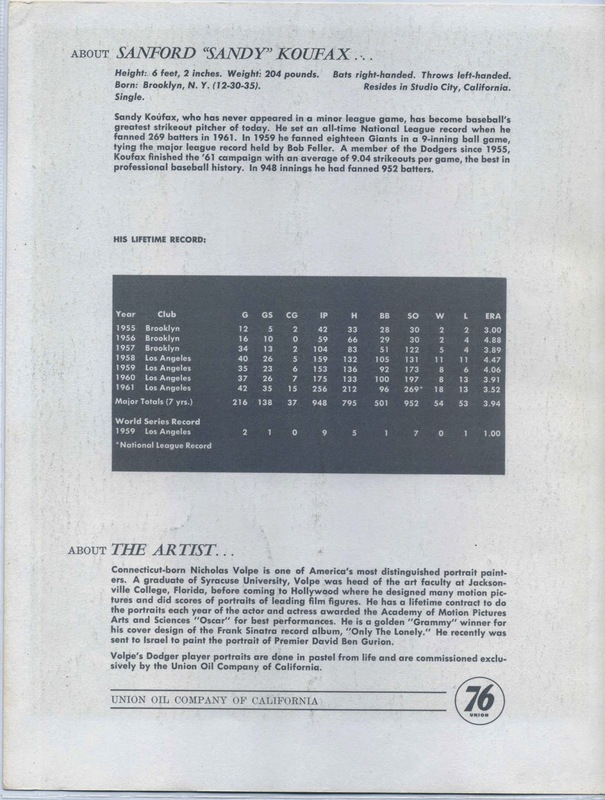 This is the very first collaboration between the Dodgers, Union 76 and artist Nicholas Volpe. 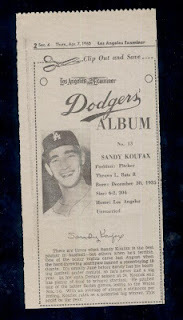 Below is the Sandy Koufax 8.5" x 11" portrait.